I got the idea for our crispy burritos here. I tweaked it to fit our family. We've made them several times now & changed one thing here or there. And they've been amazing every time. Hope you enjoy them, too. This recipe made 12 burritos total. We made up as many as we needed the first day and then used the leftover ingredients for more the next day. Do not drain the juices. Push the rotel into the crockpot and remove chicken. Shred chicken with forks and return to crockpot. I always add about a 1/2 pkt of Taco Bell taco seasoning and stir until all the chicken is coated. Put the lid on and let the crockpot "keep it warm." Cook 1 pkt of Knorr Rice Sides Spanish Rice according to pkg directions. Let sit when it is done. It's okay if it cools off a little. Heat griddle to 400. Cook tortillas according to pkg directions. It is usually about 30 seconds on each side. Ours are from Costco and are Tortilla Land brand. I can cook 2 at a time on our griddle. Don't turn off the griddle. You're going to use it soon to "crisp" the burritos. Keep it at 400 degrees. Carefully wrap it up and place seam side down on the griddle. Once that side is "crisped," rotate to the back side, and continue with the remaining 2 sides. I can do quite a few burritos at a time on the griddle. 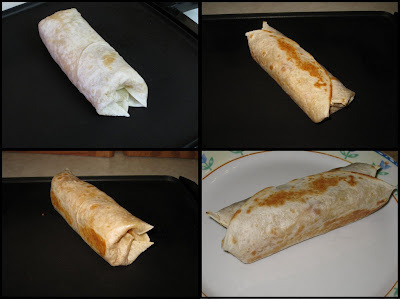 I just build the other burritos while the others are "crisping." Serve hot with green chile sauce on the side. We use a spoon and drizzle it on!